Bunratty Potcheen (so called because it was distilled in small pot stills in remote areas throughout Ireland) has been praised in song and story. Since it was banned in 1661, Potcheen has been illegally distilled, in the mountains and valleys of Ireland for connoisseurs and friends to enjoy. In those mountains and valleys real experts distilled the Potcheen from grain over peat fires using the water from nearby mountain streams. Taste and savor the bouquet of the mountain Heather on the moonbeam edge that danced with Leprechauns in paradise, and recreated the Celtic magic that is Potcheen. 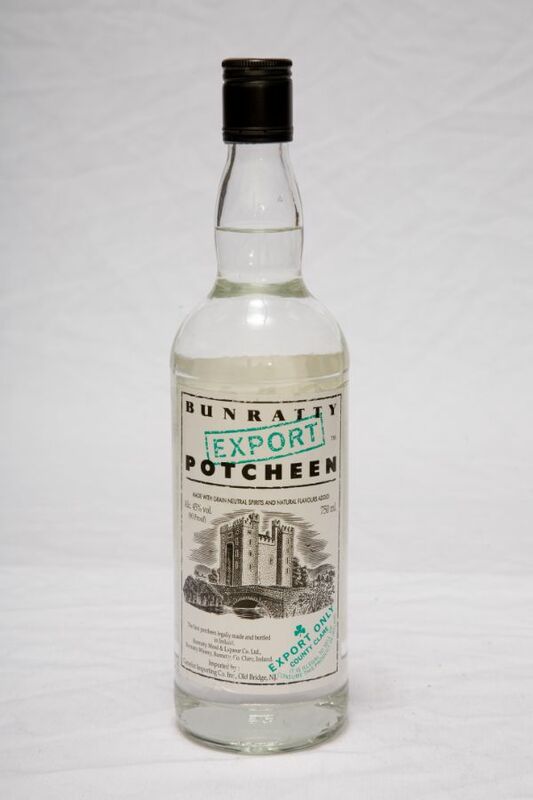 Bunratty Potcheen is the first since it was banned to be legally produced and bottled in Ireland. Originally distilled for its smooth extra strong sensation. It was a truly spiritual deed of the Irish long ago, when they trapped the purity and magic of nature to create, from sunshine and rain in the mountains and valleys, the most natural and original treasured Irish Spirit - "Potcheen". It's unique and distinctive taste, is dry and grainy with a delightful aftertaste that sweetens as it develops. Also known as "moonshine" or "mountain dew," Potcheen is a fiery tipple. We recommend you drink it neat as a shot, on the rocks or with a mixer to savoir this original Irish spirit. Now we know why Irish eyes are smiling!